10 unique glass coasters - made as a gift for a couple who have a property in the Carribbean and a table that seats 10. The Gecko was a happy memory. Each coaster is 100mm square. 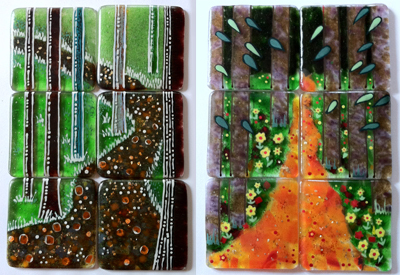 I was subsequently commissioned to make a set of 6 coasters as a memento of a walk in our woods. This client wanted a bespoke gift for a special friend. 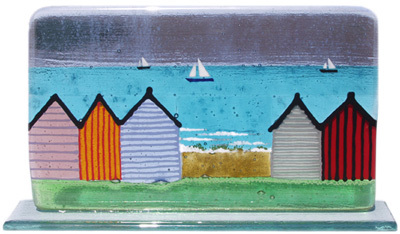 The brief was to create a free-standing piece to go on a window sill - the theme was sea, sky, beachuts and boats. The main piece is 240mm across. I enjoy combining words within my work and this piece started with the quotation. The somewhat flamboyant scattering of colour and unconventional scrolls are intended to make the piece less profound and more uplifting. This piece is now sold but can be reproduced - with another legend if you wish. Above: Three panels for a decorative splash back. 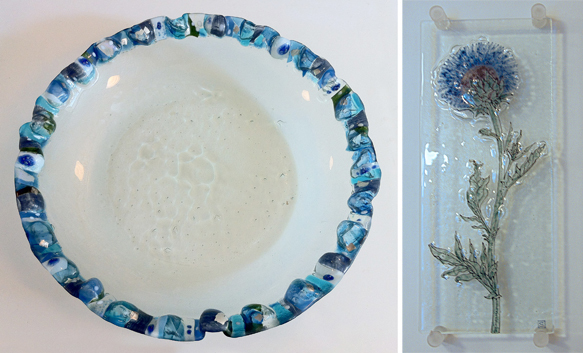 Below: Large (46cms dia) Sweetie Pie bowl and a Cardoon Wall Hanging. ...is coming along a treat... After experimenting with materials and firing schedules I came up with this concept. 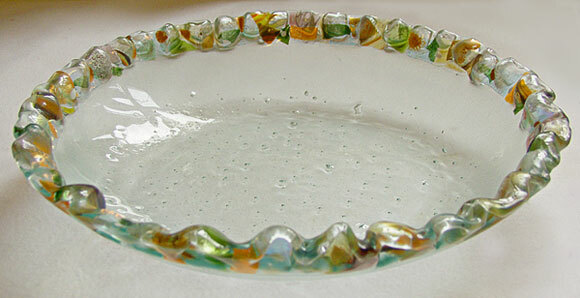 The edge looks like a pie-crust and with the inclusion of some dichroic glass which glitters or some bright gold glass (as in this plate shown right) they resemble sweet wrappers - hence the name. 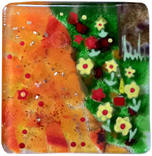 I love their "random" quality which produces a surpise every time I open the kiln. The plate shown left is a one-off made for a 4oth Birthday gift with the name of the recipient disceetly incorporated into the rim. I make bowls using the same technique - shown below - the very large blue one at the top of the page is my latest. 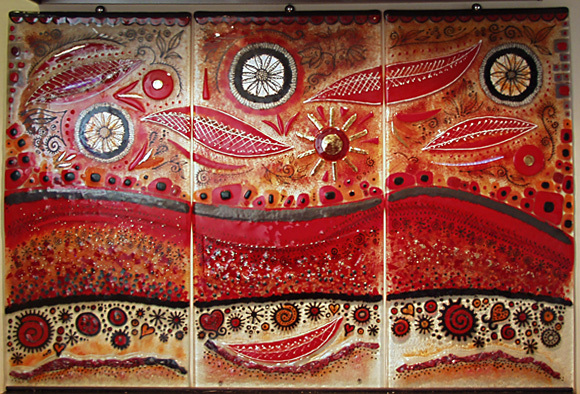 3 wall panels on a theme of autumn seed heads. There are great swathes of teasels around our property which I have incorporated with some honesty seed heads from my neighbour's garden to create these Autumnal wall hangings. I have now added a Cardoon plaque to the collection (see top of page). All these pieces are glass "sandwiches" with the images drawn and coloured in the space between. They are consequently entirely durable and will not fade or discolour. Some have a 3D quality created by "slumping" and the bubbles are entirely random - no two pieces are the same. Below is Sweet Chestnut 2. Hanging from a fallen branch of one of our 450yr old Sweet Chestnut Trees we created a shimmering representation in glass of the fruit of the Sweet Chestnut. 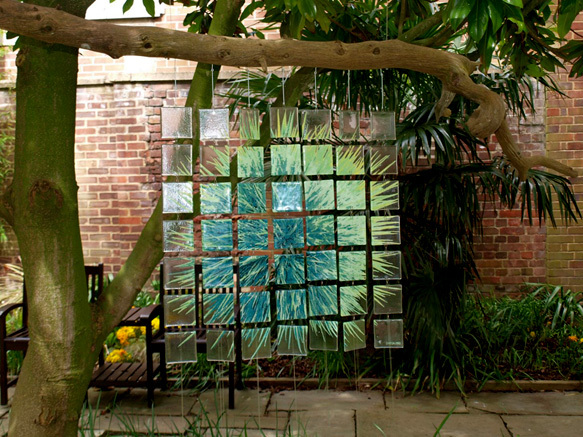 Each square has been hand drawn using liquid glass which has then been "fused " with metal loops which have been joined together using stainless steel split rings. The whole things is entirely durable for inside or outside hanging. 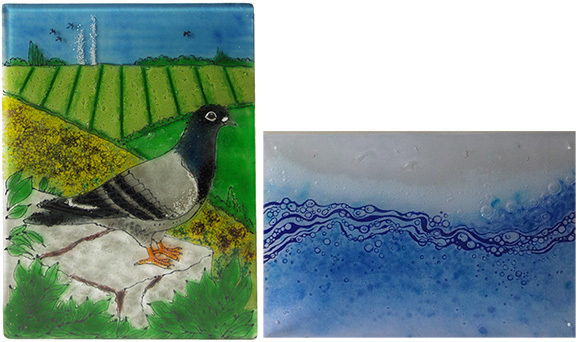 Left: A fused glass window panel for a renovated pigeonniere in South West France. 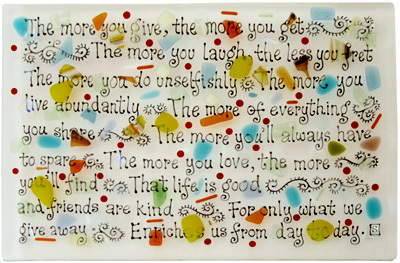 can be reproduced to order in plain or colored glass.